Crazy good Garlic Butter Brussels Sprouts that even the Brussels sprout haters will love! I toss my sprouts in a magical garlic butter sauce that’s loaded with tons of yummy flavor right after they’re roasted. So good you’ll want to make these all the time! I’m confident enough to say that you’ve never had Brussels sprouts like these before. 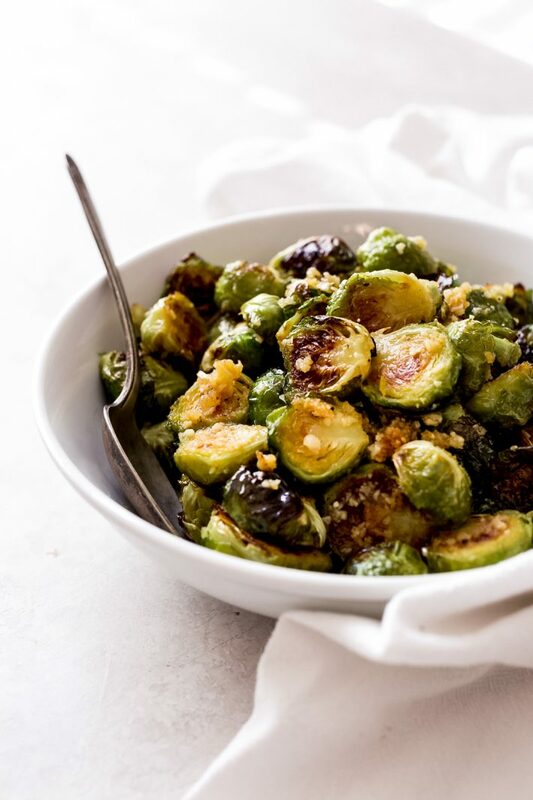 Garlic butter brussels sprouts are sure to be the highlight of your holiday table. And I wouldn’t say that if it wasn’t true. Brussels Sprouts. You know; the little cabbagey looking things that children loathe from an early age. Parents usually throw empty threats in their direction along the lines of ‘you’re not getting up from the table if you don’t finish your Brussels sprouts.’ The quintessential side dish that even the dog won’t bother eating because all that’s been done to them is a quick zap in the microwave. Certainly, nothing that’s worth your time. They’re mushy and overcooked, bitter, and or severely lacking in the flavor department. That’s unquestionably not the case with today’s garlic butter Brussels sprouts. These babies are loaded with the most amazing garlicky, sweet and spicy flavor. I wouldn’t be surprised if you decided to make a meal out of these little cuties alone! My goal this year is to bring you more side dishes that work throughout the year as well as during the holidays. Sure, things like green bean casseroles  only show up during celebrations, but my one-hour dinner rolls ? You can make them anytime! So I thought, why not make a side that you’ll want to make more than once a year? These garlicky sprouts totally fit the bill. My recipe for garlic butter Brussels sprouts is inspired by a local restaurant in Houston that literally makes the best Brussels sprouts I’ve ever had. They’re crispy and brown on the outside and buttery and garlicky when you bite into them. I’m convinced that restaurant is adding some kind of illegal substance to them to make them so addicting! WHAT INGREDIENTS DO YOU NEED TO MAKE GARLIC BUTTER BRUSSELS SPROUTS? Make sure to give your sprouts a good washing before you start. You also want to make sure you give them a good wipe down, so they’re completely dry. If they’re wet, they won’t brown in the oven to their fullest. Prepare the Brussels sprouts by trimming off the woody end and removing any outer leaves that aren’t entirely intact. Then cut the Brussels sprouts in half lengthwise before tossing them in olive oil, salt, and pepper. 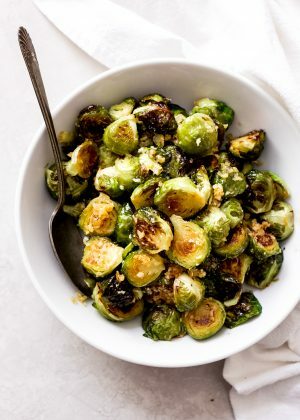 CAN I USE FROZEN OR CANNED SPROUTS FOR GARLIC BUTTER BRUSSELS SPROUTS? Frozen and canned sprouts don’t work too well for this recipe as the cells retain a ton of water and you won’t get them to roast up in the oven. For best results, I suggest purchasing fresh sprouts. To make this quicker, you can always get the ones that are already trimmed and cut in half, available in the refrigerated section of your grocery store. WHY DO I INFUSE THE GARLIC INTO THE BUTTER SEPARATELY FOR GARLIC BUTTER BRUSSELS SPROUTS? This process allows the garlic to slowly release all of that wonderful garlicky flavor into the fat without causing it to burn and all of that flavor then incases the Brussels sprouts when we toss it all together. It’s the key to making the best honey garlic butter Brussels sprouts. you’ve probably already got almost all the ingredients in your pantry or refrigerator. You can serve this with just about anything! Seared salmon , roasted chicken , or steak . You can truly make a meal out of just the garlic butter Brussels sprouts; I’ve done it, it’s that good! Brussels Sprouts may not have been your favorite/families favorite in the past, but when they’re rolled around in garlic butter, they’re sure to please even the pickiest eaters! PREP: Position a rack in the center of the oven and preheat the oven to 450ºF. Line a baking sheet with parchment paper or a piece of foil (sprayed with cooking spray.) 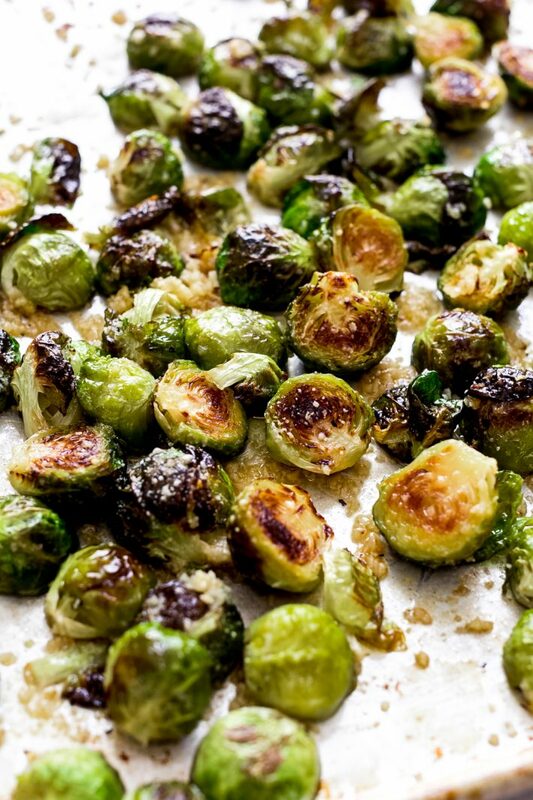 Add the Brussels sprouts to a bowl and toss with the olive oil and a ½ teaspoon of salt and a big pinch of black pepper. 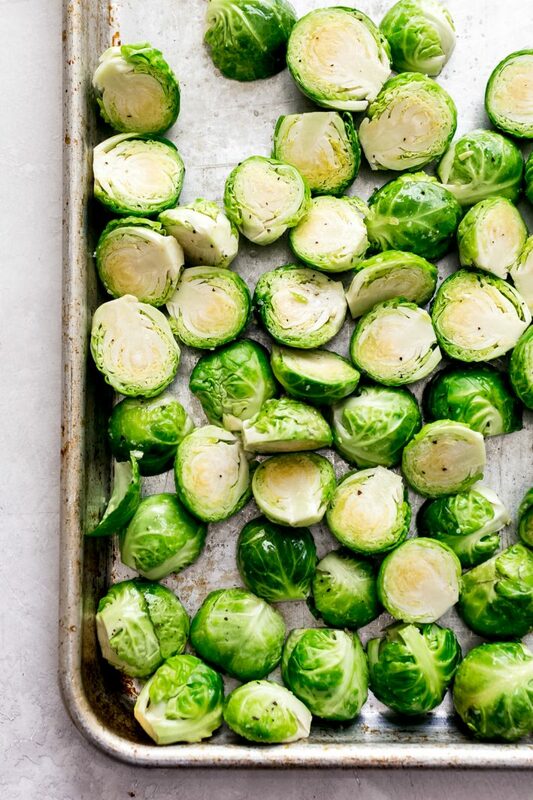 Roast the Brussels sprouts for 18-20 minutes or until they crisp up, tossing about halfway through. GARLIC HONEY BUTTER: When the sprouts are about 5 minutes from being done, add the butter, garlic, honey, and cayenne to a microwave safe bowl. Zap the mixture for about 30 seconds – 1 minute or until the butter melts completely. Stir to combine. 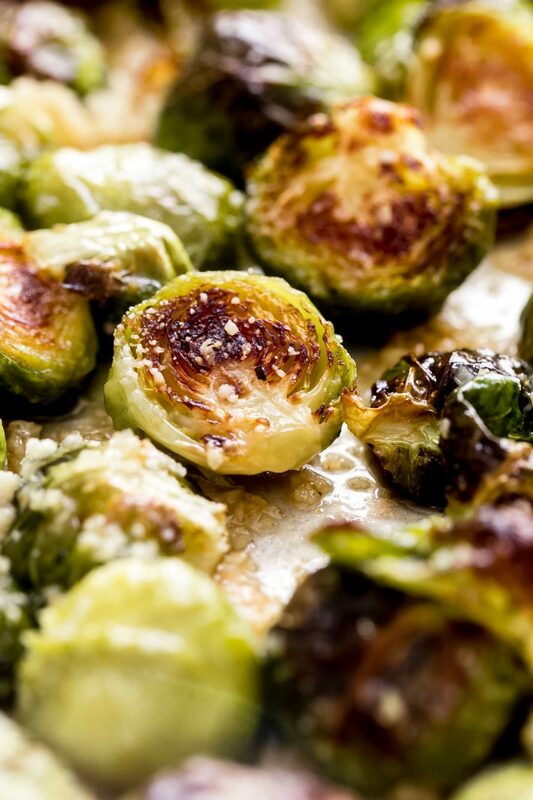 When the Brussels sprouts are done, toss them in the prepared garlic honey butter and sprinkled with parmesan cheese. FINISH: Toss to combine and pop them back into the oven for another 5 minutes or until the cheese melts. Serve warm!